Quick Disclaimer:  Since I do not have my own S/4 Fiori setup, my access to screenshots is limited for this article. I'll do the best I can. For ages, the primary way to access your SAP ERP system was using the tried and true SAP GUI installation. Every so often SAP GUI would introduce a new “theme” to liven things up a bit, but it’s largely been unchanged over the years. Fiori was first introduced in 2013 as version 1.0 as a prong in their mobile-first approach highlighting relatively simple task-based use cases. Fiori reached version 2.0 in 2016 and now offers hundreds of apps ranging from those older task-oriented ones to robust new interactive reporting tools designed to manage entire processes. There are plenty of resources online for learning more about Fiori, so I won’t go into too much detail. SAP has a blog post which walks through some of their UI innovations from over the years. Here is a better one. How about those new SAP Fiori Apps? As mentioned above, one of the biggest advantages of SAP Fiori is its selection of apps. While most currently available apps are simply Fiori-enabled versions of SAP GUI screens, many Fiori apps are actually unique to the Fiori platform. As you would expect, these apps are designed with usability in mind, so they are easy for new users to pick up. Training users on the new Fiori apps has been a breeze. The challenge is — as it always has been — with training on the SAP GUI legacy transactions which are still very much required. While there are limitations when compared to their SAP GUI counterparts, many of the Fiori apps are robust and full featured — at least, enough to get through most scenarios. 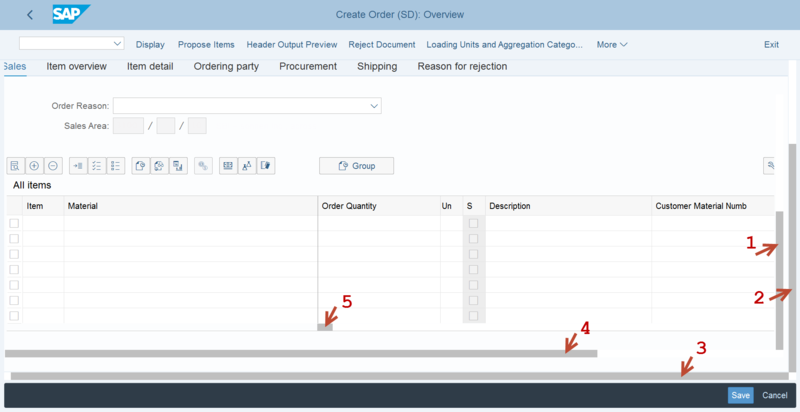 For example, the Fiori app titled ‘Manage Purchase Orders’ quickly lists existing PO’s by a variety of selection criteria, but also allows you to create a new PO from scratch or with reference to existing Purchasing objects such as Info Records, Contracts, or other PO’s. There are too many apps to cover in any sort of detail, so hop on over to the SAP Fiori Apps Library to learn more. One thing to note: My understanding is that Fiori Apps need to be loaded and configured for use in your environment. There has been a misconception that S/4 HANA comes with all these apps included and that the first time you sign on you will be swimming in Fiori apps. You will need to evaluate the available apps and scope out the ones you wish to include in your system. The SAP Fiori Apps Library does include some tools which recommend specific apps based on your current transaction usage. How about that Belize Theme? SAP Fiori introduces a visual design titled ‘Belize’ (as well as a higher contrast version called ‘Belize Dark’). One of the key attributes of Belize is that it relies less upon SAP’s traditionally cryptic set of icons and buttons. For instance, instead of the classic ‘Pencil and Glasses’ icon which has always meant ‘Switch between Display and Change modes’, Belize now has text that might say, “Switch between Display and Change”. Many of these elements do improve the user experience, but they have also made some questionable design decisions. As mentioned above, SAP has opted for text-based links or buttons over the hieroglyphic buttons of this past. This greatly reduces the available options across the top of the screen. All other system functions are then forced into a single “More” drop-down menu where you access additional functions as well as the traditional ‘Edit’, ‘Extras’, and ‘Environment’ sub-menus. Ironically, this adds clicks to certain functions instead of the desired streamlining. The Fiori/Belize concept includes scroll bars, of course, but they have omitted the arrows which in the past have allowed you to scroll up or down by a single line. Instead, the user is forced to Page-Up / Page-Down or do a click-and-drag maneuver on the scroll bar and hope you don’t over-shoot your target. By default, even the latest version of SAP GUI (750, in my case) also forces the user into the same Belize user interface which brings with it the same advantages and hurdles mentioned above. 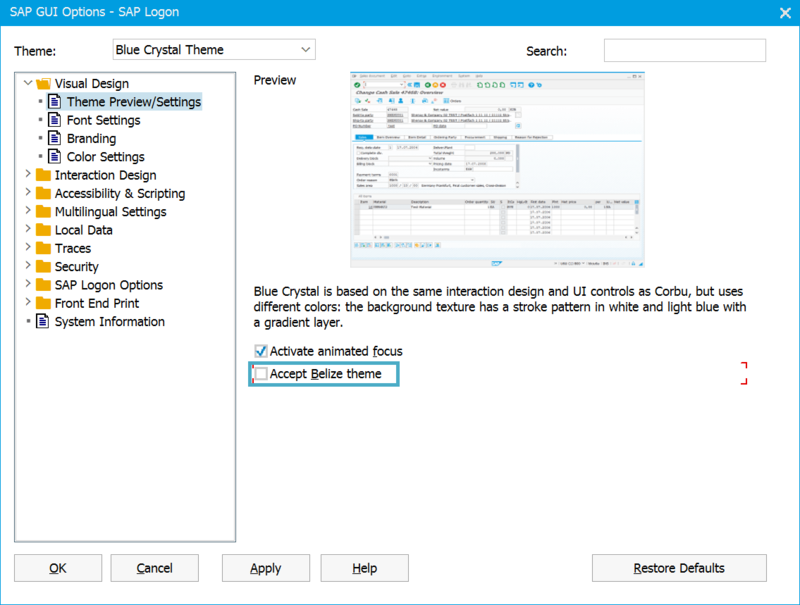 In the event that you’re not happy with Belize on SAP GUI, you can opt for a different theme; you simply must untick the ‘Accept Belize Theme’ option from the Visual Design –> Theme Preview/Settings menu in the Logon Pad. How about that Web Front-end? Web-enabled SAP processes aren’t new per se, but Fiori takes this to a new level. The power and the convenience of this technology means users can realistically use the web front end exclusively (read: no SAP GUI at all). There are some caveats, however. While SAP has developed a respectable catalog of newly designed Fiori apps, users will still largely rely upon Fiori-enabled SAP GUI transactions. Users — especially new users — will experience this juxtaposition of a clean, attractive, smooth user experience alongside the comparatively clunky, clicky, ugly traditional user experience. Moving between the two can be quite jarring. As apps continue to be introduced and upgraded, I hope to see this duality become more and more scarce. To highlight another example of this ‘duality’, consider user parameters. Parameters are a tried and true handy way for users (or system administrators) to set default values for certain fields in SAP GUI. A SAP GUI user can access these values today using transaction SU3, or by accessing their System –> User Profile –> User Data menu option (in v750). Newly developed Fiori apps have an equivalent function called “User Defaults” available in the Fiori settings menu. The options available in this menu is dependent upon which apps the user can access. This is definitely a much more user-friendly way to handle this requirement, but if a user is leveraging BOTH new Fiori apps AND Fiori-enabled SAP GUI screens, that means there are two places where these defaults must be maintained. Another thing that may seem like a nice-to-have but work noting is that due to the nature of the web-based front end, Fiori seems to have little ability to cache ( or “remember”) the last document processed when entering a transaction. As a SAP GUI user, one of the features you can take for granted is how SAP remembers the last document processed. When you save a Billing Document in VF01, your next trip to VF02 and VF03 proposes THAT exact billing document number. Similarly, users who are accustomed to hitting Backspace in a field to see the list of recent entered values will be disappointed that this does not work in Fiori. Each app feels like it’s standing alone without that continuity between transactions. Another inconsistency I’ve found is that some apps open in a new browser tab while others will open up in the source browser tab. The result is that throughout the day a user may end up with a bunch of browser tabs open unnecessarily. Most users will be able to manage their browser tabs manually, but it’s just another thing that you have to explain to your users. On a related note, one thing you and your users will need to take note of is adding an exception for any pop-up blockers you may be running. How about that SAP Business Client? Honestly, I haven’t used SAP Business Client (a.k.a. Netweaver Business Client, a.k.a. NWBC) in years. When I was waist-deep in performing pre-sales demonstrations, we used Business Client exclusively to highlight — at the time — SAP’s flashiest user interface. But in day-to-day support consulting, SAP GUI has always been my go-to. Over the past few years, SAP has continued to develop the Business Client and I see a clear use case for adopting this as my primary client in the near future. The main benefit is that Business Client allows user to access BOTH the traditional SAP GUI user experience as well as the Fiori front end all from one client. As a support consultant who accesses a variety of client systems on a weekly basis, this will be critical — especially as more clients adopt S/4 HANA and the Fiori front end. Fiori’s ability to meet the requirements of a mobile workforce is obvious. Most mobile devices now have some sort of VPN capability. That, combined with the availability of the web-based front end or SAP Fiori mobile applications means secure access to SAP can be a reality. Unfortunately, I have not had an opportunity to directly work with Fiori in a mobile-enabled process, but I hope this changes soon. Even though S/4 HANA and Fiori have been around for years, we’re still squarely in the adolescent phase of the technology. All of its current shortcomings — Belize and its odd scrollbar design, the catch-all “More” menu, the dichotomy of the old and the new — should all improve as the solution matures. The benefits and promising future of this technology certainly make a great case for Fiori as a viable alternative to SAP GUI — especially for new implementations. What are your thoughts and feelings on Fiori? Please share them in the comments below.